It was a really nice day, so I decided that a trip out on the motorbike was in order. 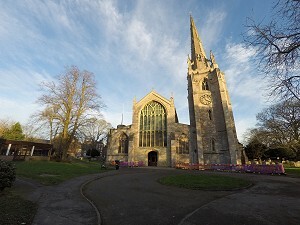 After some slight navigational difficulties I eventually located the church of Ss Mary & Nicolas, Spalding. 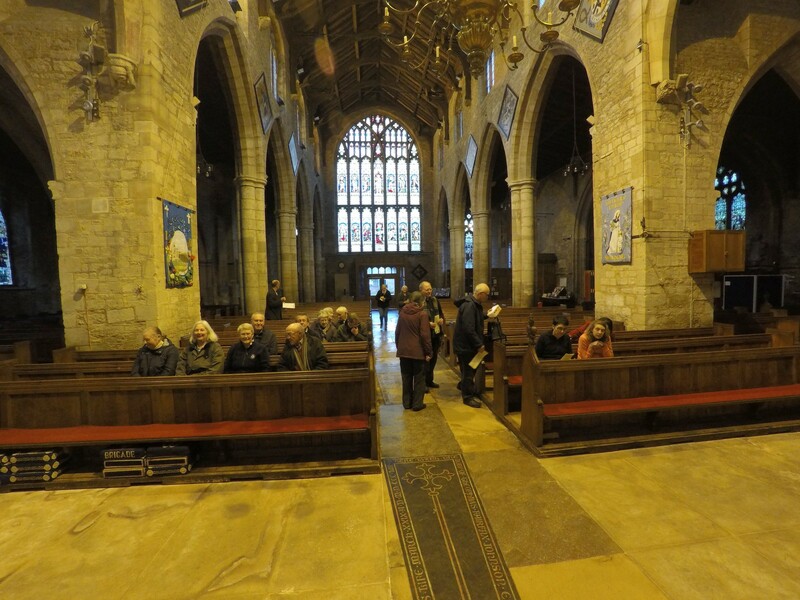 We rang the bells before the service. Ringing included Rounds and Call changes and Plain Bob and also Stedman and Yorkshire Surprise Major. The service was taken by the Revd John Bennett. Elloe had produced a little service booklet for the occasion, based loosely on the "Green Book". 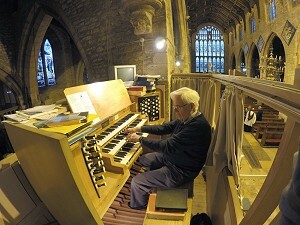 Les Townsend from the Central Branch played the organ for the service. During the sermon, John Bennett quoted some famous poems about bells such as "No man is an Island" by John Donne, which finishes with the line "And therefore never send to know for whom the bell tolls; It tolls for thee". Also Edgar Allan Poe's poem "The Bells" and Alfred Lord Tennyson's "Ring out Wild Bells". The bells are there to be heard. They mark special occasions. They ae a potent symbol for the mission of the Church. This is a message for everyone. They are an invitation to come and hear the simple message of the Gospel. Les Townsend does his thing! 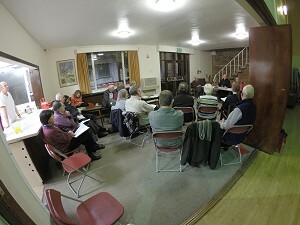 After the service, we made our way over to the Church Hall, for a meal and the usual copious amounts of tea and coffee. The meal consisted of pre-ordered Fish and Chips, brought in from Sheddies Fish and Chip shop by Phil Hall who works there and is also one of the local ringers. Lots of bread and butter was provided as well. Once the meal was over the meeting began. Since there were not many people present we all crammed into the side room rather than use the main hall, since it was warmer. 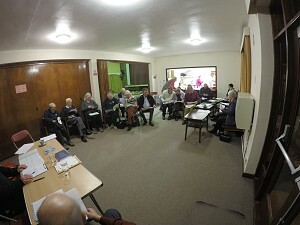 The President, the Revd Jonathan Sibsey started the meeting. The Revd John Bennett was thanked for taking the service and thanks was also given to Les Townsend for playing the organ. Once the apologies for absence had been taken, it was announced that Barbara Webster would be standing down as Secretary after this meeting. Philip Green presented Barbara with a pail of flowers as a thank-you from the branch for her work as Secretary. 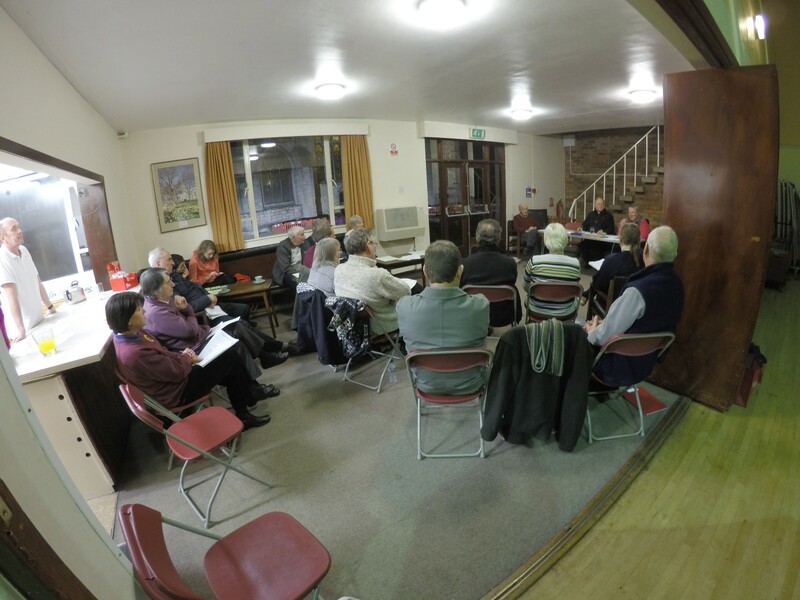 The minutes of the last meeting had been circulated in advance and were accepted by the members. 100m of rope for splicing had been purchased by the Branch. It would be sold at £2/meter. Elloe did not have any young ringers in the Ringing World National Youth Contest last year and also were unable to enter a team in either the Guild striking competitions, although Elloe hosted the 6 bell in 2016 at Whaplode and Moulton. Events in 2016 had been a bit sparse. No extra events had taken place, mainly because no members has proposed any other events. Health & Safety and Safeguarding are likely to become more prominent in 2017. Elloe did not enter a team in the 6 & 8 Bell Guild Striking competitions last year. Membership is up. The number of junior members increased from 4 to 7 and the number of adult members increased from 75 to 77. Money raised in 2016 is down, mainly due to the lack of events taking place. There are 2 churches in the Elloe Deaneries Branch with unringable bells and 7 churches where there are no ringers. Hopefully membership will continue to rise. Carrie Staley was not present but her report was given on her behalf. The figures look good, apart from the Bell Repair Fund which has dipped below £1000. John Bennett gave his report. Much of what he was going to say had been covered by the Secretary. His objective is to further the ringing of the bells on Sunday. However conditions are not ever so favourable. There are just 19 towers in Elloe and 5 of these are silent. The bells at Gedney Hill and Tydd are in good condition, they just need ringing. Some towers have no resident bands, but the bells get rung thanks to the efforts of neighbouring towers. The towers are undermanned, especially the 8 and 12 bell towers. Congregations are depleted and there are no youngsters. John is unsure how to address this problem. 38 Quarter Peals and 19 Peals were rung during the year. Paul (Doades) has been very active, organising 2 outings during the year. The November meeting at Surfleet was well supported. Elloe could not raise a band for the 6 bell striking competition. Hopefully in 2017 they can pu a team in. 30m of rope has been sold to Long Sutton. Donington are allegedly unringable. However John has had a look at them and he couldn't see any real problems. The frame has some slight surface corrosion. The stays and pulley boxes are in good condition. Some of the clappers might need attention. The clock room floor is unsafe and is being propped up by two vertical pillars from the ringing room below. Robin Heppenstall (Bell Advisor to the DAC) has also had a look and agrees with John. Ian Ansell is prepares to donate a spare rope to help get them ringing. It has been reported that the local incumbent does want the bells rung, but only for services. This may not in fact be the case. The previous officers we re-elected apart from the Secretary, Barbara Webster. The Vice Presidents are all local clergy who have churches with bells. The list of officers is therefore as follows. The question was asked about a proxy for Guild Committee meetings. Philip Green said he would stand in. Alan Payne (Guild Master) addressed the Branch members. He thanked Barbara for her work as Secretary. She has kept the branch going. Having no Secretary is not unusual. The Guild has not had a secretary for a year now. The rest of the committee took up the slack. Do not get despondent. If anyone fancies organising a bit of ringing then just get on and do it. You don't have to be an officer of the branch. Don't beat yourselves up over it. Organising from the top down doesn't work. It has to be done at the tower level. The secretary's job is basically one of communication. They are a funnel for information to pass out to the members. The secretary does not necessarily have to be a ringer, just someone with the right skills. 7 new members were admitted to the branch. Carrie is concerned that the Belfry Repair Fund is decreasing. Some ideas were suggested like maybe a voluntary contribution from the members of say £5/year, or transfer some funds from the General Account. The local Round Table donated money for ropes to one tower. Peal bands should always give a donation, as should Quarter Peal bands. £1.50 per rope is a good figure for Quarter Peal bands. 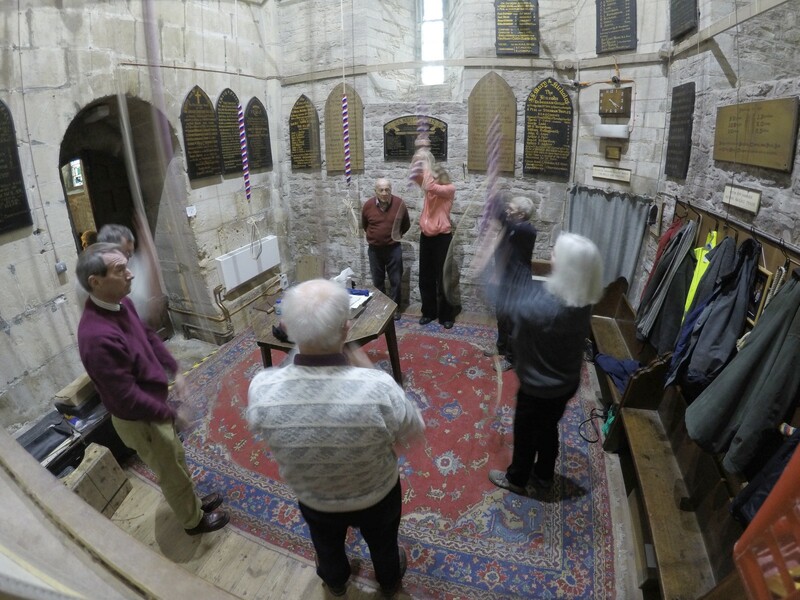 Local community charities can be a good source of income if bellringing meets the criteria. The revd Jonathan Sibsey thanked the members for all they do in ringing the bells at the local churches. Our towers are important! There is a lack of young people. Events like the Church Schools Festival can help where the Sixbel simulator is used in the Cathedral to promote ringing. Good links with the schools is something we should strive to achieve. Further ringing took place afterwards, only slightly interrupted when the rope on the 2nd slipped the wheel. We had to ring the bells down before going up to fix the problem. I left at about 8:30 and made my way back to Lincoln, the journey back being not quite as pleasant (on a motorbike) as the journey there.